I have been feeding my Parmigiano Reggiano addiction again. The stuff truly is amazing. If you have only ever eaten that nasty canned parmesan you need to save your pennies and try the real thing. You will be shocked, at how different it is. *Warning* It is expensive. Some would consider it very expensive. It is one of those things in life that I do not mind spending a little bit more money on then usual. Once you try it, you will completely understand. It is not what you expect. There is a fruity almost nuttiness to it. Hard to capture how amazing it is in words. Great of course on pasta, fantastic in salads, I love it with just slices of apple and it is even good on popcorn. In the hunt for something a bit different I kept coming across this recipe from Ina Garten. In the bowl of an electric mixer fitted with the paddle attachment, cream the butter for 1 minute. With the mixer on low speed add the Parmesan, thyme, salt, and black pepper and combine. With the mixer still on low, add the flour and combine until the mixture is in large crumbles, about 1 minute. If the dough is too dry, add 1 teaspoon water. Dump the dough onto a floured board, press it into a ball, and roll into a 9-inch log. Wrap in plastic and refridgerate for at least 30 minutes. Preheat oven to 350° F. Cut the log into 3/8-inch-thick rounds with a small, sharp knife and place them on a sheet pan lined with parchment paper. Bake for 22 minutes, until very lightly browned. Cool and serve at room temperature. They are fantastic! I’m thinking another batch is in order! I love savoury sablés! Those look terrific. 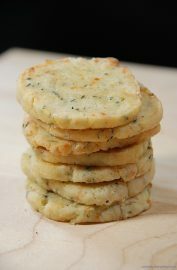 These remind me of something we make but we call them savory shortbread. Now I’m craving these…they’ll be great with soup. You’re right on real parm being expensive – but so worth it. We usually get it at Costco to save a few $.